Whenever I log on to one of my forms in the editor the text color will change from white (or whatever I last saved it as) back to the default color. This means any time that I edit one of my forms I have to re-set the font color and save it again. It is only a minor thing, but it can become quite irritating. We apologize for this inconvenience. Unfortunately, I failed to replicate this issue on few of my test forms. The font colors are saved properly and do not revert to default font color. Thanks, I have tried your suggestions but with no luck. Do the labels not appear white in your browser too? The text-shadow declaration in each rule makes the labels (especially the sub-labels) appear sharper. Want to explore the capabilities of CSS more? Have a look at videos 4 to 6 in this series. 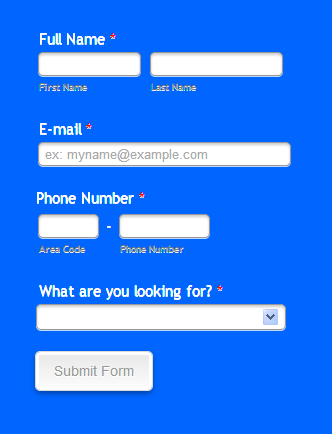 If you would like further assistance with this or anything else JotForm related, we'd be happy to help. Incidentally, here's how to inject CSS into the form.